The older I get, the more I love throwing on an easy dress to give me a put-together look with little effort. When the temperature can change 20-30 degrees in a matter of hours this time of the year, my go-to winter to spring uniform are good long sleeved dresses in a lightweight material. Depending on where you live, add some cute high heel sandals or a denim jacket to fit your climate. I picked six of my favorites (all under $100) to help you get in the spring spirit while not totally freezing your tush off. Clearly, I own #3/Hunter Green V-Neck Dress and just love it. I’ve worn it through the fall and winter already, and fully intend to continue to wear it through spring. I’m wearing it in a size S. I also just received #5/Sage Bell Sleeve Dress in the mail and it fits beautifully! The material is figure flattering and soft. Can’t wait to take some pics in it soon. I ordered it in a size 6P (fits like 2-4P) and it fits true to size. 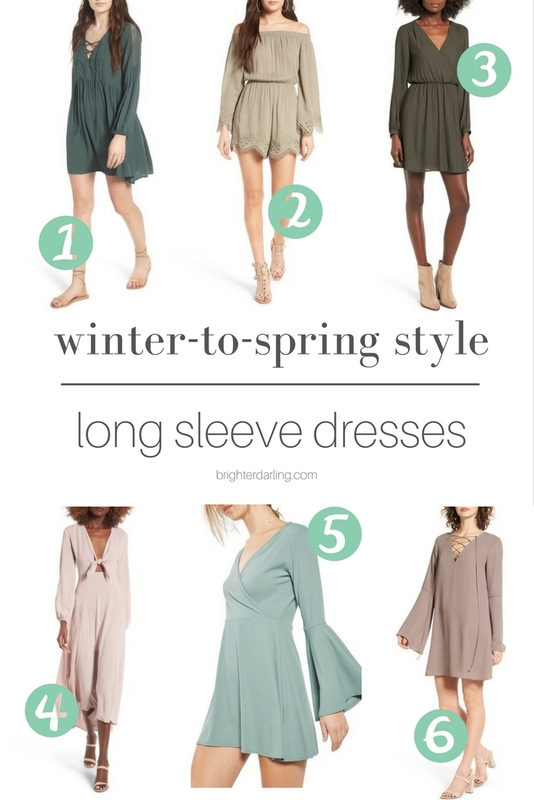 When shopping for long sleeved dresses for spring, pick neutral colors. These are shades that you can wear year-round and don’t scream fall or summer. I also like a lightweight material that easily layers. You don’t want to wear a heavy material when the temperature hits 70, yet you want something thin enough that if you throw a jacket over it, you don’t feel like The Hulk. My last tip would be to make sure you can wear your long sleeve dress with at least two shoe styles – a sandal and/or a boot/bootie. Usually, this lies in evaluating the length of the dress. "5 Drugstore Product Must Haves"
"The Only Bar You’ll Go To Looking Prettier When You Leave | Cos Bar"